With the Safety Cutter from Klauke you can be certain that cuts on live cable will be safely carried out. The newly designed ASSG safety cutting system is approved by the Trade Associates and certified for use on copper cables and aluminum cables with voltage rated up to 60kV. The system uses two dynamic 5 Ah Lithium-Ion rechargeable batteries for durability and assurance that the tool will last. 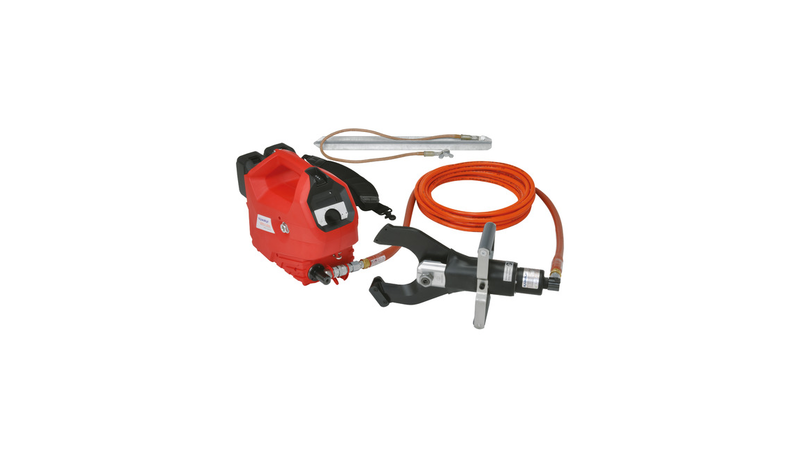 The cutting head and connector piece are both able to rotate to a full 360° for use at any angle or worksite. However, safety is of the utmost importance with this product; so we installed a 10m long hydraulic safety hose and a remote control to direct the machine so that the user has ample room to stand back from potentially dangerous situations. In addition to this, the large display shows the bar rating to make sure it stays within optimum limits. The dual battery system is housed within a sturdy compartment to resist impact and protect the battery from harm. There is also the option to secure the machine to ground using the earthing rod (it is mandatory in Germany). Please note the safety regulations in each country.